Before the tribes of Chickasaw and Choctaw were two different tribes, they were one entity. The tribe was split into two groups, each with their own leader. Chiksa' and Chahta were brothers and led the two groups. Before the split, the two groups experienced many years of war with a powerful enemy. The two brothers decided it was time to travel to different lands and have peace once again. As the two groups set out, they took with them a sacred pole, or Kohta Flaya, given to them by their creator, Aabiniili'. The legend tells that they would drive the pole into the ground each night when they stopped to sleep. The next morning, if the pole was leaning in a certain direction, the groups would travel that way. If the pole was standing straight up, it meant they had found their new homeland. After traveling for months, they went through the process one night of driving the pole into the ground. When they awoke, the pole was swaying back and forth, something that had never happened before. When the swaying stopped, the two brothers could not agree on the position. Chahta claimed that it was standing straight, and they had found their new home. Chiksa', however, claimed that it was still leaning east. The two could not come to an agreement. Finally Chiksa' declared that those who believed the pole leaned east should follow him onward. Chiksa' continued until it stood straight again, about 100 miles to the north of the location that Chahta and his followers had stayed. 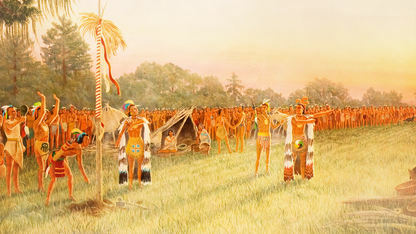 From then on, the followers of Chahta were known as Choctaw, and the followers of Chiksa' were known as Chickasaw.